The scientific name for leopard gekos is Eublepharis Macularius. They may live 20 or more years and grow to be approximately 8-10 inches long. Their common coloring is yellow and white with black spots (hatchlings start out striped, and gradually change to the spotted appearance). There are several color (e.g. high yellow, leucistic and pattern (e.g. jungle, striped) variations. Leopard gekos are nocturnal, ground dwelling, and generally docile and easy to tame. They do not have the toe pads like other geckos so do not climb very well. They do have eyelids, also unlike other geckos. A 15-20 gallon tank is large enough for 2-3 geckos, but there should only be one male per tank (and only keep males and females together if prepared to deal with offspring!). Half logs provide hiding and climbing space, as can commercial reptile caves and simple cardboard boxes. A damp hide box can help with shedding (a plastic container with a hole in the lid, with moist soil or moss inside). Young geckos shouldn't be kept on sand, as they may ingest it and get a blockage. Paper is absorbent and easy to change, and indoor outdoor carpet works well too. Avoid wood shavings. Whatever is used, make sure it is not being ingested along with the gecko's meals. Being nocturnal, leopard geckos require no special UV lighting. A regular incandescent bulb could be used to provide a basking spot, but leopard geckos probably prefer dimmer conditions so consider using a red bulb or ceramic heating element to provide the temperature gradient. Undertank heaters can also be used. 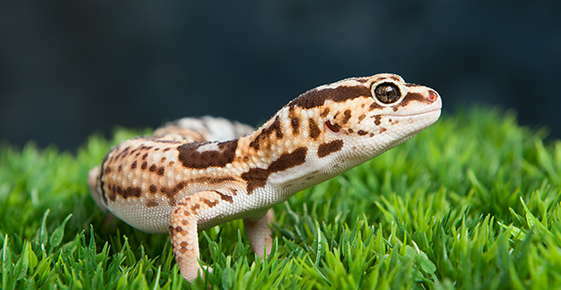 Leopard geckos are insectivores: feed a variety of crickets, waxworms, mealworms (in moderation only) and even an occasional pinkie mice for adults. Insects must be gut loaded for at least 24 hours prior to feeding, and coated with a calcium/D3 supplement (every feeding for young lizards, every other feeding for adults). Feed juveniles daily (a few crickets), adults can be fed every other day (6-10 crickets). A shallow dish of water should be provided, and cleaned very regularly.